These were pretty close to what I expected based on the pictures and others' reviews. They are easy to hang and look great at the end of my hallway. 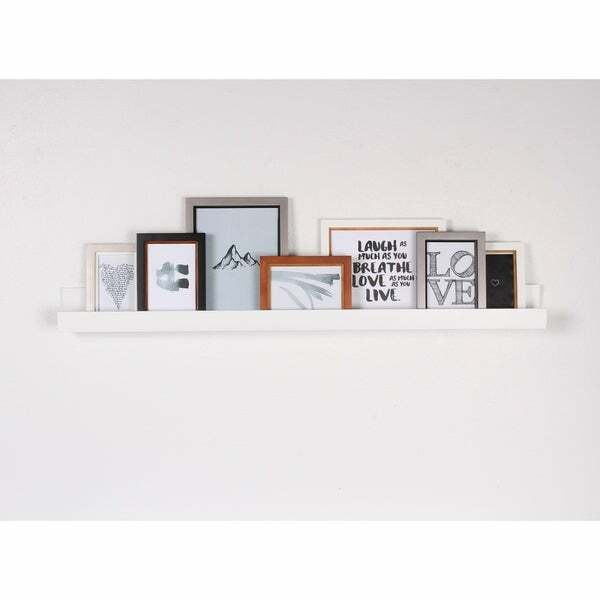 Proudly display family pictures with this modern floating shelf. With a simple, contemporary design available in a variety of colors, this shelf is a simple accent that enhances any aesthetic. Dimensions 3.25 In. X 42.0 In. X 3.5 In. I don't have a lot of wall space to put pictures in my bedroom but this solved the problem. It is great looking and very sturdy. I will be buying 2 more of these floating shelves to put in my other bedroom. Very easy to install, took my husband maybe 10 minutes. Even he liked the looks of this shelf. I highly recommend. Love this floating shelf, it fit the spot I had for it perfectly and when I got my pictures in it they are the highlight of the room. This is first floating shelf I have but not last. Simple to install anyone can do it, colors fit perfectly in my living room. Thank you Overstock. I bought three of these in white to display my daughters books in her nursery. Nice shelves, they came perfect, and without scratches. Everything was fine upon delivery and product was in good shape only No screws. I am very happy with this shelf, it’s excatly what I was looking for my space. Great quality. Easy to install and looks great. 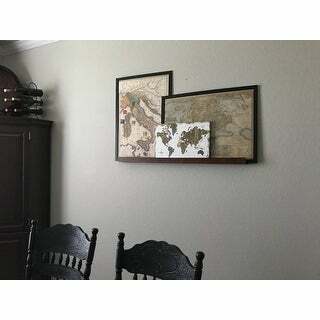 Easy way to display pictures without having to make holes all over your wall. Two screws is all it takes. I need to start reading dimensions closer! This shelf is very long! It’s awesome though! The profile is small enough to not be cumbersome, yet it allows the perfect amount of photo frame sizes and shapes! Love it. Nice looking shelf but NO HARDWARE or instructions included. Shelf has two pre-drilled holes and that's it. You're on your own. I used for frameless, white matted photos. Now I can arrange and re-arrange as I wish! REVISED: one shelf came unglued when I was trying to figure out placement and mount to wall. Looks as tho the item is NOT wood, but maybe fiber board? I searched a long time for the best value without sacrificing quality. This was a good purchase. I purchased 2 shelves to hang as one long shelf. The only issue I had besides being slightly different in each shelf was the natural knots in the wood. My picture frames covered most of them up. Just what I needed! Looks good. Not too deep yet still holds plenty of the family pictures. I like the picture ledges I purchased. I was surprised, though, that they came with no hardware. Strange! Great! Easy to hang and looks nice. It is important to note that they are very shallow shelves so large art (bigger than 8x10) has a tendency to fall off (i.e., there isn't enough room to lean them). I made it work anyway, but if I were to purchase something similar I would get slightly deeper shelves. Very pretty gold, not very wide! My daughter uses it o display her small dolls collection. Purchased 4 floating shelves to display my daughter's album collection in her room. She's happy! Looks great! This is the second time ordering - liked it for pictures in the bedroom and wanted to put some more on the eopposite wall to take them off the dresser. Really nice shelves. 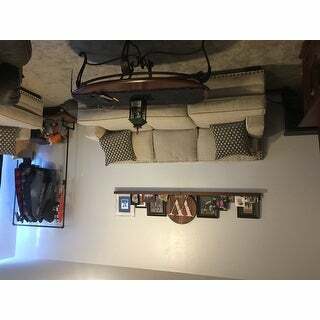 One is a little warped looking but with picture frames on the ledge you cannot notice. I love this shelf. 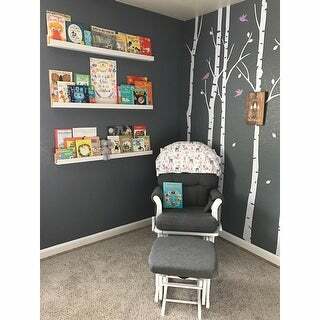 I’m using it for a nursery and put books and pictures on it. The color is perfect and no chips or cracks! "Can I order them in black?" "What is the weight limit for these?" The weight limit for these is approximately 5 pounds. "What is the width of the shelves?" "What are the center to center screw hole Measurements in the vertical board that goes against the Wall? I would be mounting the shelf into 16 inch centered studs. Does this match up?" "Can this be cut without too much damage? I need 77" of shelf so I'd buy 2 and cut one to match width of my wall mirror "
"What is the actual measurement of the slot that holds the picture frames"
The lip is 1.75 inches wide.